With its chassis largely unchanged from the earlier 950cc version it is the engine that marks the 990’s arrival. KTM bored and stroked the smaller unit to create a power plant with no more horses but a good deal more torque, just what you need on a machine like this. Pulling from as low down as 3000rpm the fuel inject V-twin is a real work horse, happy slugging away on the rough or speeding up and down motorways at speed this engine is a versatile and easy to use addition to an already superb biking package. 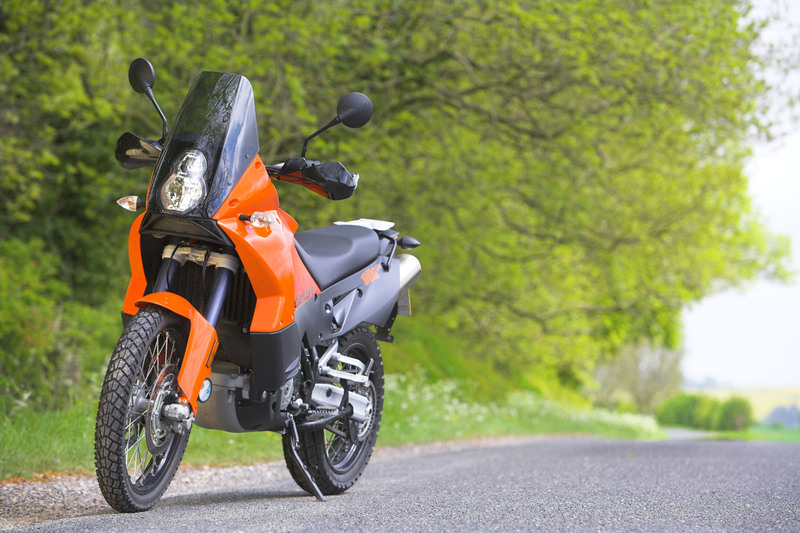 Being a closely coupled V-Twin the engine takes up little room making the KTM a compact machine to be on and a well balanced one too, it can change direction almost by thought process, ideal for heavy traffic or light off-roading. The riding position is not compromised and the Adventure is roomy where it matters most, the position is comfortable while the overall ride is totally addictive, soon the KTM and you become one, the engine is joined directly to the wrist and the chassis feels more like it ahs been put on rather than sat on. In keeping with the genre, the seat height is lofty and can prove tricky when mounting up or stopping for traffic lights and junctions, a quick slide across the seat to enable a positive one foot approach was needed for my 5’8” chassis and smaller folk could well be in big trouble when at a standstill. 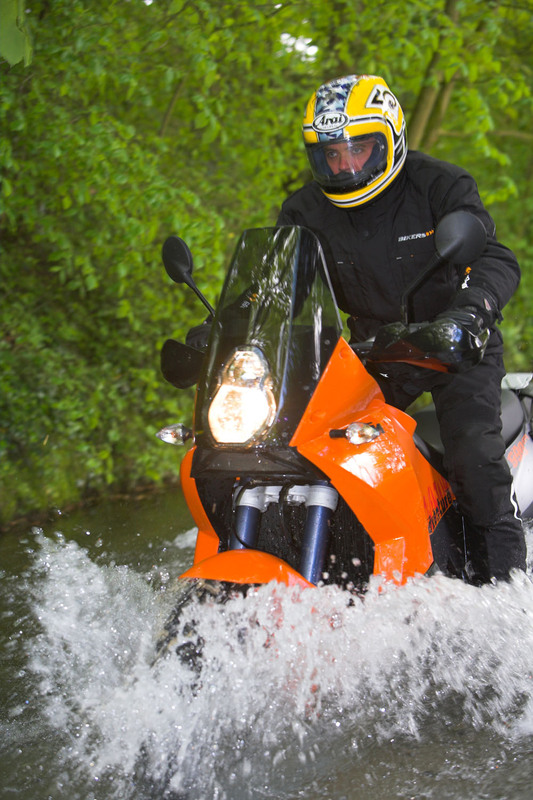 Within minutes of riding the big KTM the bikes character comes to the fore, like few other machines, this bike has a real identity and way of doings things and I would rate it higher than the benchmark BMW R1200GS. Despite its long travel suspension, the road handling is sharp and predictable while the engine is willing and powerful enough for the job in hand. Throttle response is quick at all revs and thanks to the massive torque on offer there is little need to shift up and down the box for corners and other obstacles. On board the cockpit is neat and tidy, easy to read when on the move and great looking too, especially when the light dims and the back lit display is allowed to show itself in its full glory. It’s a great package that has clearly been well developed and tested before it makes it way to the end user. Adding a dollop of icing to an already highly decorated cake is the cracking Brembo stoppers that adorn each end, the front twin disc set up is responsive to the lightest of touches hauling this big bike up at will but with complete control. Used prices remain high across the KTM range, a testament to the types current popularity in the UK, and a sure sign that they have more than a few things right with their machinery. For a lot less money you could get any of the Japanese equivalents, except they aren’t equal in any way once tested, in short don’t take a test drive on a KTM unless you can afford it, as you will want one. In recent times the Austrian firm, KTM have transformed their range and fortunes too, 15 years ago they were a small niche manufacturer, producing less than 8000 units a year, last year they topped the 80,000 mark, making them the 2nd largest European producer of large capacity motorcycles, the leader being BMW. The KTM brand isn’t just about bikes, but rather a lifestyle choice with a vast array of clothing and branded accessories to keep you and your machine looking great, either when riding or socialising.